What Github Triggers and Actions are Supported? New Commit Comment - Triggered when a new comment on a commit is created. New Issue - Triggered when a new issue is created. New Watcher - Triggered when a new watcher is added to a repo. New Repo Event - Triggered when anything happens on a repo. New Notification - Triggered when a new notification is created. New Label - Triggered when a new label is created. New Branch - Triggered when a new branch is created. New Collaborator - Triggered when you add a new collaborator. New Review Request - Triggered when a review is requested from you or a specified user. New Gist - Triggered when you add/star a gist (public or private). New Repository - Triggered when a new repository is created. New Mention - Triggers when your Github username is mentioned in a Commit, Comment, Issue or Pull Request. New Milestone - Triggered when a new milestone is created. New Global Event - Triggered when anything happens from or to you, on any repo. New Pull Request - Triggered when a new pull request is created. New Organization - Triggered when a new organization is created. New Release - Triggered when a new release is added. New Commit - Triggered when a new commit is created. Select your organization, repo and branch. Create Comment - Creates a new comment in an Issue or Pull Request. Create Gist - Creates a new gist. Create Pull Request - Create a new pull request and merge it (optional). Create Issue - Create a new issue. Update Issue - Update an existing issue. Find Pull Request - Finds a specific repo pull. Find Issue - Finds a specific repo issue. Find User - Finds a specific user. Check Organization Membership - Finds a specific members. Find Organization - Find an organization, whether or not you are a member. You can then give your Account a title or label, which is just for your convenience and helps you track multiple accounts. It doesn't have any affect on which Account you actually add to Zapier. 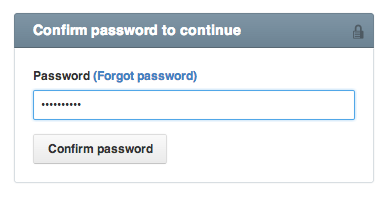 You'll also be prompted for your password to continue. Now you can continue creating your Zap. 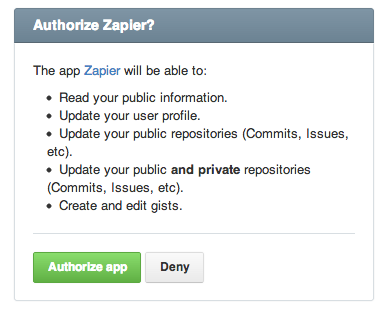 Sadly no, right now you can only use Zapier with the hosted version of Github on Github.com. What you can do in certain instances is set up outbound webhooks from your Github installation to send to Zapier when certain things happen (like post-commit hooks). You can use the Zapier generic webhook service to receive those webhooks and trigger a Zap. You may need to approve third party applications for your organization - follow the guide here. Then, go back to your Zapier account, and try connecting your GitHub account again. You should then be prompted again to select the organization you'd like Zapier to have access to, and be able to approve that as needed. GitHub considers Pull Requests an issue, so they will be picked up by the New Issue trigger. You can use a filter for the PR URL to exclude these. Additionally, for the trigger to work properly, you can't have viewed mention in GitHub, otherwise GitHub will mark it as read and it won't be seen when we poll.